The ocean wave is one of my favorite painting subjects. It is challenging to capture the power and constant motion of the ocean. To paint a realistic oil painting of an ocean wave can take many hours. I will work on this painting in stages over the next 2 weeks. I hope to have this ocean wave painting completed by mid October and along the way I hope to show you how to paint an ocean wave here on my blog. If you have any questions or comments just ask below in the comment box and I will try and answer promptly. This unfinished ocean wave painting is about halfway toward completion by artist P.J. Cook. As you can see I have spent many hours laying in the rocks with the water spilling off the rocks and back into the ocean. There is foamy water leading your eye back into the painting. I pay close attention to the direction of the water and how I can use it to create a nice flow for the viewer. If you look closely there is an “S” motion from the bottom center of the ocean wave painting, around the rocks and up toward the next incoming wave. This motion leads the viewer from the focal point first and then meanders up with the foam trails into the center of the canvas and eventually to the breaking wave in the background. 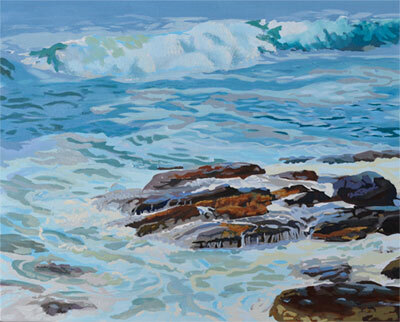 Laying out the composition is an important step in creating a successful ocean wave painting.